Supernatural explores differing views on leadership and the fears that live deep inside people that they try to bury. The most interesting thing going on for Sam this season is that he’s in a position of leadership and acting as a mentor for a group of Hunters. Even though they have experience fighting a War against Angels on their post-apocalyptic world they have almost no experience in Hunting because the skillsets are vastly different. On their world it was about survival at any cost where Hunting is more about investigation and strategy with a degree of secrecy involved as most people on this world have no knowledge of what goes bump in the night. Sam has put things in place to make the experience as safe as possible. This includes regularly checking in, body cams that are always broadcasting footage to a server and using experienced Hunters to offer pointers when needed. The plot of this episode kicks off when Maggie (actor) fails to check in during her first solo hunt and Sam becomes concerned so opts to investigate personally. There are a few schools of thought on what the right thing to do in this scenario is, Bobby thinks that Sam made a mistake as he felt that Maggie was nowhere near ready to take on a Hunt on her own. Sam stands by his decision to some extent because it seemed like a simple enough job and Maggie was confident that she could handle it on her own. Dean backs Sam up because he thinks that there’s no such thing as ready when it comes to Hunting. As far as he’s concerned the best way to learn is to jump in the deep end and learn on the job because that was his experience. Bobby probably thinks differently because he has an emotional attachment to those that crossed over from the other Earth so feels responsible for the which could mean that he finds it difficult to accept them getting hurt especially when following the instruction of someone else. To Sam’s credit he has put a lot of things in place that don’t guarantee safety but make survival far more likely though it’s unclear why he didn’t implement a buddy system for at least the inexperienced Hunters other than the plot of this episode needed to exist. In fairness this is addressed and Sam admits that he made a mistake that he subsequently corrects. Fallibility makes for realistic characterisation and allows for engaging drama as others make their voices known. I really like the idea of Hunting becoming a modern operation. Sam is taking the best things about the Men of Letters and applying it to his own personal philosophy in an attempt to create an efficient operation that basically provides a necessary service along the lines of the Emergency Services. In time Sam could essentially create a supernatural police force with its own training practices and organised missions. Maggie’s disappearance ties into the Michael plot in expected yet interesting ways. The Djinn is an underused monster that presents unique challenges with a power level that makes perfect sense for Michael to enlist. 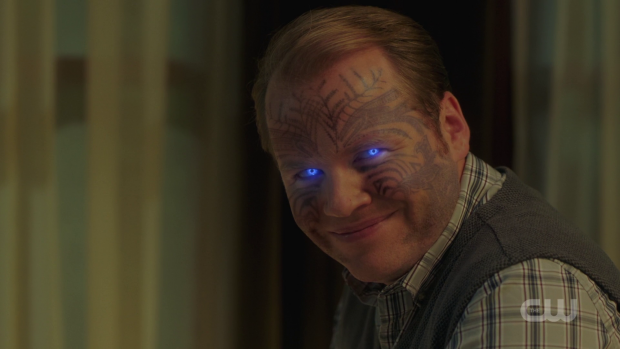 This particular Djinn (Chris Patrick-Simpson) assuming that Dean’s arrival was a bizarre test was a fun twist on the monster in hiding plot point that appears in many episodes as the Djinn was playing along with what he thought was Michael testing his commitment to the cause. Michael’s plan remains ambiguous as every monster he recruits has a different objective. The Djinn is tasked with finding a quiet location and killing as many Hunters as possible. This is something he clearly enjoys and the enhancements to his abilities that allow him to be able to read minds and bring nightmares to life is also a bonus for him. Basically he’s a monster that feels invulnerable because his powers have been enhanced. This continues the trend of familiar monsters representing a very different threat to what we’re used to which freshens up the show significantly. 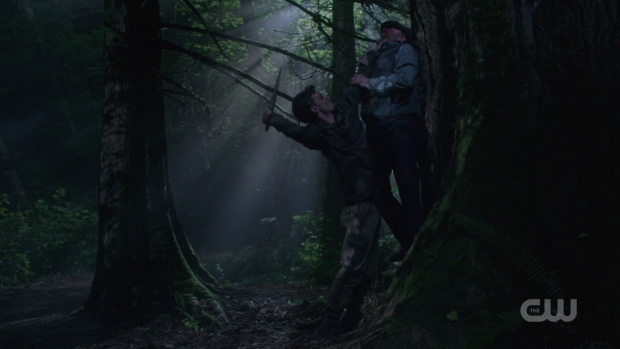 It gives standard hunts an added threat level and allows the Winchesters to be surprised by what they encounter. The Djinn’s attempt to look into Dean’s nightmares failed which suggests that Michael is either buried deep inside or has put some kind of protection on his vessel so that he can return someday. Sam and Dean do learn that Michael is setting various traps for Hunters using his new suped-up monsters. The purpose of this is unclear other than the obvious objective of thinning out the opposition though I’m fairly certain that Michael doesn’t consider Hunters a threat so my thinking is that he has something else in mind that will become clear in due course. For now it’s fun to see Sam and Dean so clueless as to what will come next along with Sam’s attempts to make sure his group of Hunters are ready even though they are lacking in experience. The manifestations of fear worked really well for some characters. This version of Bobby had a son who was killed by Angels and he naturally blames himself for this. He says that he got his son involved in the War so feels responsible for his death. This resonates with Sam and Dean who understand what it means for Hunters to follow in the footsteps of their father since that was the life they lived though they have been altogether more fortunate than Bobby’s son. Learning this detail of Bobby’s past allows them to understand him better and realise that he’s very different to the man he knew. It also helps differentiate him in the eyes of the audience as he has been very similar up until this point. It turns out that Bobby and Mary’s partnership has worked out really well for them as there are definite feelings forming between them. Mary is conflicted over these feelings as she’s reluctant to enter into a relationship with someone so closed off. Confronting the death of his son causes Bobby to open up to her somewhat suggesting that the relationship might not be a lost cause entirely though there’s a lot of work to be done before they are truly open with one another. I’m not against the prospect of a Mary and Bobby relationship as it makes a lot of sense considering they are both essentially resurrected characters but it’s difficult to accept it as presented because it has been newly introduced in this episode with only dialogue to suggest that they have been growing closer. The show has told us about it without showing it which makes it difficult to invest in so the steps forward don’t have as much impact as they should. There is a rare chance for Sam and Mary to bond. 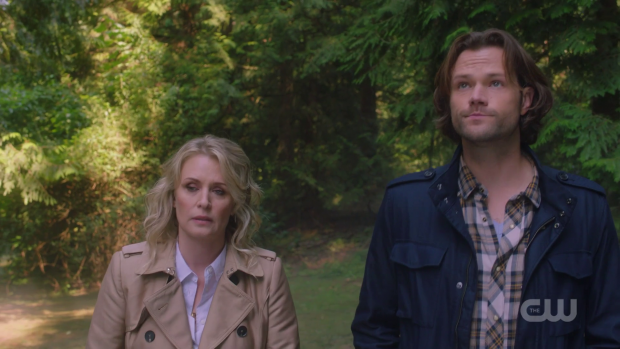 The mother/son connection has never been strong between them which makes sense as Sam never had the chance to form a relationship with her before she died so there’s a tension associated with knowing how strong their connection should be and not actually feeling it. What comes of this is a very different sort of relationship where Mary is starting to see Sam as more of a peer with a sympathetic ear which is certainly unconventional as she points out when she realises how candid she is being with him. Their discussion about John and how much he changed since Mary died was great because it gives Sam greater insight into his father while reconfirming how deeply Mary’s death affected him. The importance of parent/child relationships is also explored in Sasha’s (Leah Cairns) conversation with Dean. She opens up to him about how inadequate her father was as a parent and recounts the time she found her mother after she had killed herself. Now she is faced with the only family she has left being a father that she resents. 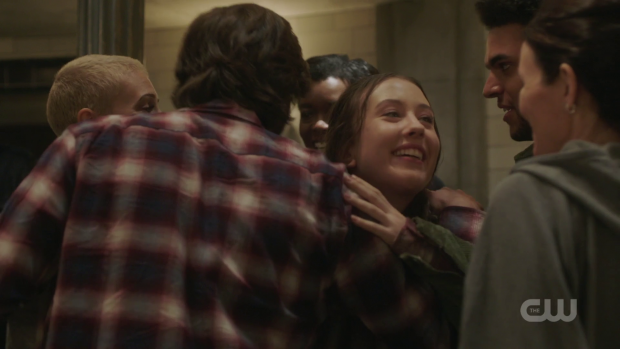 Dean’s advice is for her to put it behind her because there’s nothing she can do about the past so allowing herself to be weighed down by associated baggage is pointless. This comes from a place of experience after years of letting himself succumb to his own baggage so feels entirely sincere as a piece of advice if not altogether healthy. I feel that this is a discussion that could have continued as what appeared on screen only felt like part of something that could have been so much more compelling. Dean’s input to the conversation does suggest that he’s at least trying to move on with his life after everything he has been through which seems to be the ongoing arc post Michael possession. A strong episode that brings back an underused monster in a really fresh way and furthers the main season plot without feeling too contrived. Sam’s approach to training the new Hunters and keeping track of them using technology is a really smart idea that suggests a possible future for the show where Hunters perform something of an organised public service. 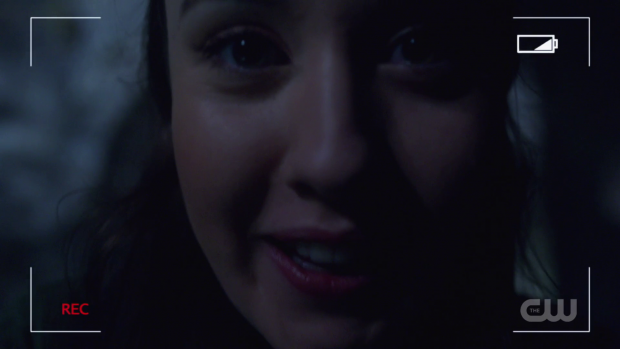 The episode addresses that Sam made a mistake letting Maggie hunt solo because she wasn’t ready for it and uses his mistake as a point of growth for him. Bobby’s differing views on Sam’s leadership work really well as conflict and tie into the larger issues he’s having over his dead son as well as other losses experienced during the War with the Angels. The suggestion of a relationship between Bobby and Mary isn’t a bad thing as such but since this is the first indication of it there isn’t really any reason to be invested though it does provide a good opportunity for Sam and Mary to bond. Parental relationships run throughout this episode as shown through Sasha and Dean’s conversation where she talks about how inadequate her father was and Dean advises her to let the past go because there’s nothing that can be done about it. It feels like the first part of a larger and more interesting conversation but it does show that Dean is willing to at least try putting the past behind him and move on with his life. The Djinn being another of Michael’s suped-up monsters works really well as Michael’s intervention changes the threat level associated with this particular monster and adds a freshness to the show since familiar monsters won’t be predictable. Michael’s plan is still unclear but the slow reveal of different elements such as the traps he is setting for Hunters maintain the sense of mystery and makes everything that happens feel connected in some way.